For once, it isn't me that's taken up a new hobby - it's A. So yesterday morning, I headed to Reading Climbing Wall with him to see what all the fuss is about. 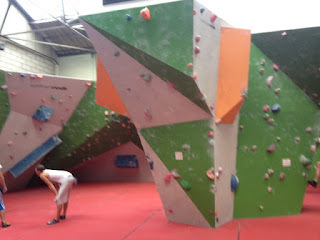 I stuck to bouldering - this is climbing without ropes and harnesses. 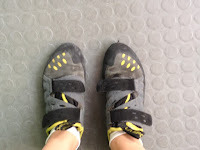 Apparently it is kind of harder than rope climbing because you can't rest and take the weight off your arms, but I'm not quite ready for being suspended by a rope and travelling high up a climbing wall. The highest I climbed was with my feet about 5' off the ground. I hired some shoes, stuck my handbag in a locker and A gave me some basic instruction. Did I enjoy it? Yes, more than I expected to. Did it hurt? Totally - arm muscles slightly wrecked and small blisters forming on hands. I think I lasted half an hour, and I was attempting to club for less than half of the time. Will I do it again? Yes, although I'm not taking it up as another serous hobby - just something to do occasionally. Ah you are so much braver than me. I know I do not have the upper body strength for this but wish I could do it! Good Sport, You, for giving it a go! You do get up to the most fun things. Stay close to the wall and never stick your bum out it instantly Unglues you from the wall. Try to be decisive in your moves hanging by your fingertips gets v. tiring v. quickly so push with legs and go for it. P.S. climbing boots are riddiculously sticky and will grip the tiniest of surfaces.